The next Unpacked event where Samsung plans to unveil the Galaxy Note 9 is just around the corner and based on previous launches, we're expecting the phablet to be available for pre-order soon after the announcement. Just like it did with the Galaxy Note 8, which hit the shelves on August 24, the upcoming Note 9 is likely to arrive in stores on the same day, but one year later. Although sources from Taiwan's handset supply chain claim the Galaxy Note 9 will be launched on the market earlier than the previous model due to low Galaxy S9/S9+ sales, that won't happen in Europe. European carriers will be taking Samsung Galaxy Note 9 pre-orders until August 23, and anyone who buys one during that time will receive their devices on August 24, which will also coincide with the phone's market release. So, if you hoped to get your hands on the Samsung Galaxy Note 9 earlier than expected, you might want to set your expectations lower. However, we do not rule out the possibility of an early market release for the Note 9 in other regions like South Korea. I've heard some rumors that the blue version might be a Best Buy exclusive. That would explain the yellow S-Pen. I really hope that's not the case though because it's the one I'd go for at this point. Yes. Just blue has yellow pen. I didn't ask a question, so I'm not sure I understand your response. I got confirmation that T-Mobile will get the blue version and the black version. Also 128gb is the base storage option from what I'm hearing. Awesome! That really makes my day. Not that I don't believe you, but how'd you get that info? One person commenting on another site stated a visiting Samsung representative told him that T-Mobile and Verizon will sell the 8GB/512GB version. That got my attention and I'll leave it to speculation or spurious rumor for now. The person was supposedly in a T-Mobile store when this is alleged to have happened. I had been hoping that the 128GB model would be sold but I am in favor of overdoing things where it's prudent. Samsung Reps are showing this beast in the stores. 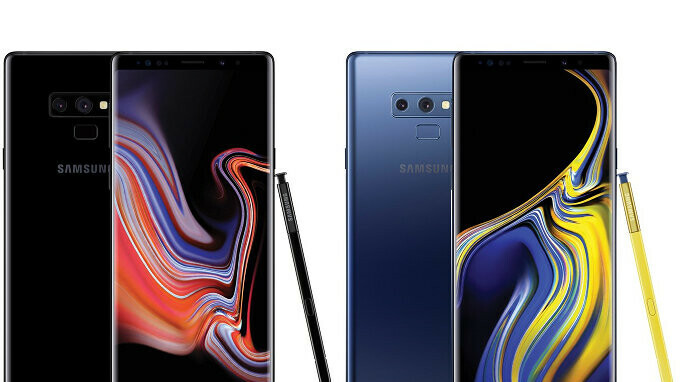 Would really like the top-spec Note9 even if it is more expensive since 4K video eats up a lot of gigabytes. I regularly back up my media yet having that large capacity is attractive in case I let it go for a week. Speeding these to consumers as Verizon did last year. The Note8 was widely available on September 15, 2017 if memory serves. Verizon shipped pre-orders over last Labor Day weekend releasing those on September 5th, 2017. The Note 9 to me I guess because I have the 8 is not every overwhelming. Though I use to upgrade every year because I just want a new and fresh device, I may just skip this one. But if they offer a good deal to get the 9 with the new Galaxy Watch, I will certainly be in on that deal. I just hope the rumors to join the Note and S into a single series doesn't happen. What I would like to see is Samsung just release the S and Note together in the same time frame as the iPhone to see what would happen as far as sales.